Personal income tax, or PIT as it is commonly reffered, is a tax levied on all wage earners within a given jurisdiction. With the exception of Brunei and Cambodia, the former having no PIT in place and the latter a fixed 20 percent rate, ASEAN members all employ a progressive taxation system wherein an individual is taxed according to how much they earn. This results in individuals with a higher salary being taxed at a greater rate than those with a lower one. Rates vary wildly across the regional bloc, with some countries capping their maximum PIT at as much as 45 percent and others at as little as 17 percent. Although its fluctuations have not been as pronounced as those of CIT (corporate income tax), the individual income tax rates of ASEAN have for the most part also been experiencing a downward turn in recent years. Vietnam, Malaysia, and Indonesia, for instance, have all marginally lowered their PIT rates since the turn of the century. 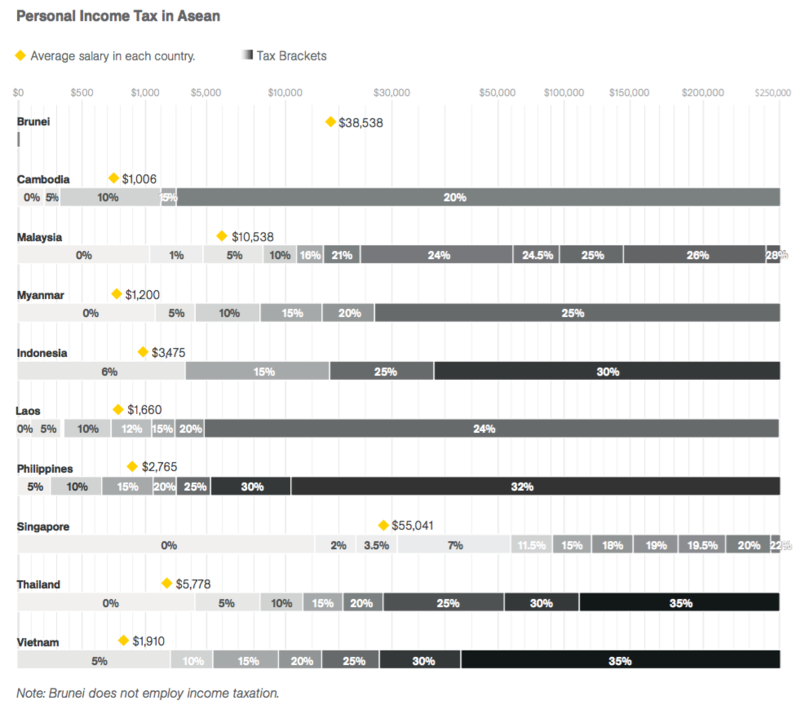 To make up for this revenue, however, many countries have increased taxation in upper tax brackets. For many of ASEAN’s economies experiencing rapid growth, there has been a drive to create new tax brackets to accommodate rising incomes. Myanmar, most recently, created an income band for top earners which currently levies a 30 percent tax. Below, we outline PIT tax brackets in individual member states. To help readers understand how these rates fit into the context of these countries’ wage structures, we have also included the average salary of different ASEAN states.